What is the best Adobe FormsCentral alternative? Adobe FormsCentral retired its form builder on July 28, 2015. Whether you’re a past Adobe FormsCentral customer still looking for a replacement or exploring form builders for the first time, Formstack is a strong competitor in the form builder market. Internal process management, team collaboration tools, and advanced form features and integrations make it easy for you and your team to get business done. Empower your organization with a versatile online form builder. Save your department some money with one solution that can solve multiple problems. Keep important information organized and error-free in one easy, centralized location. Make better decisions with data insights from survey results and form conversion tools. Eliminate time spent on manual, day-to-day tasks. Quickly set up automated workflows to breeze through your day. A form solution for any problem. Formstack's flexible form builder can help you and your team solve business problems, no matter what industry or department you're in. Integrate your forms with over 40 apps and 60+ Zapier connections to send form submissions to your CRM, email marketing platform, payment processor, and more. Or create a custom solution with our Formstack API and Webhooks. Pull valuable insights from your forms with advanced features. Use Partial Submissions to collect the data that someone entered into a form before abandoning, or use A/B Testing to find the better-performing form between two variations. Set your team up for success with Formstack. What are you waiting for? 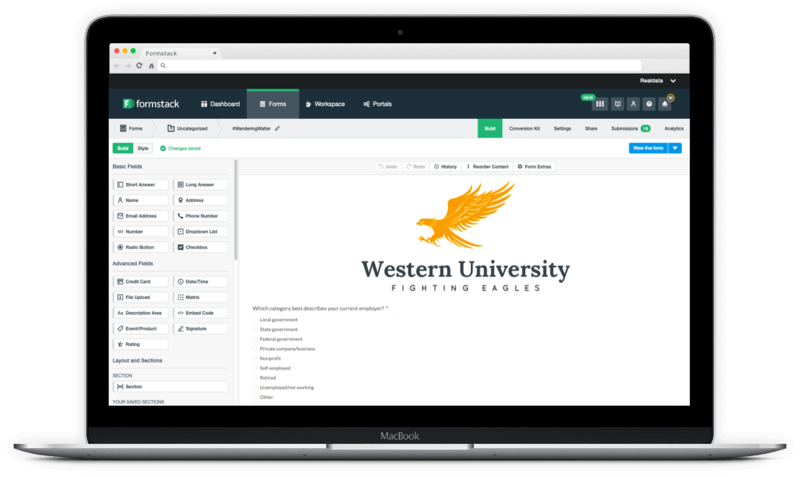 Try our free demo builder or sign up for a FREE 14-day trial to start creating powerful order forms, event forms, surveys, and more.